Welcome to our Washington Videos section! More videos for you to download from our southern locale! Remember that on most media players, you can right click on the movie and change the size of the movie to the one that you prefer ... although, don't go too big on the lower quality, small screen options ... you'll feel like you're looking at a moving checkerboard!! We hope to add a few more in this section, as well as our others, very soon! 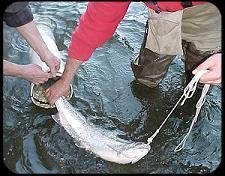 A wild hen steelhead being inserted into a transport tube for her journey to the Snider Creek hatchery facility on the Sol Duc River. 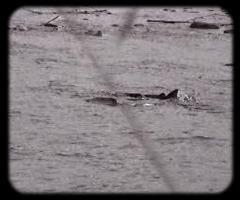 are contagious when running some of the wilder stretches of river on the Olympic Peninsula. Here, Kent and Joe get a little wet in the rollers at the base of the Sol Duc Hatchery diversion dam. They still can't decide which was more fun ... the fishing, or the boat ride! 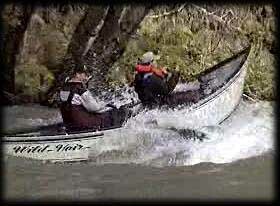 Our third double header of the day during the '98 fall salmon season on Washington's Quillayute River. 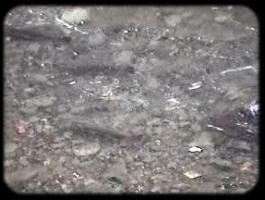 In this case, both fish are silver (coho) salmon. 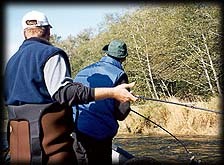 Bob is just done playing his to the boat, Richard is working on his. We've decided we're going to keep one more for the barbeque. The decision is which is better barbeque fare .... you'll see how Bob decides! Technically not one of the more difficult area rapids to run, Haystack (some call it Sawdust) Rapid in the Bear Creek stretch of the Washington's Sol Duc River is always a fun ride with its big rollers nipping at the bow of the boat. Color commentary provided by the 'Chin Brothers'. 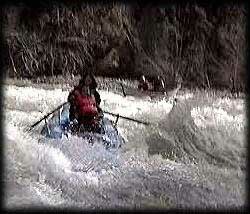 This clip gives you a good idea of what a ride through many of dozens of rapids of the area's rivers is like. is part of the game when we want it to be. 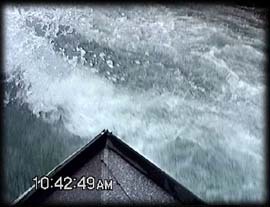 Although not part of a rapid, the rollers off of the rock just above Spring Creek at the Sol Duc Hatchery provides a wet blast for those in the front of the boat. 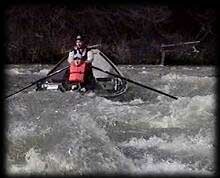 Taped on a day when the river was too high to fish, we just chose to go for a little joyriding! Bob and Luke go over it first, followed by Kim and Corey in the Puma, an inflatable that we often use in very low water conditions when certain stretches of the rivers are too low to float a driftboat. ... is the cry of the 'Wavegals' in another Bear Creek Rapid. 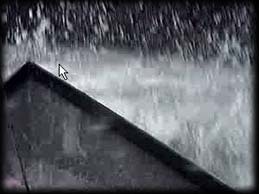 Shot the same day as the video above, the high water flows made fishing impossible, but a wet, giggly ride a reality. The flow on this day was approximately '22 boards' ... about two feet two high for fishing. ... is Luke's cry right here. One last video from our playday! Just some big rollers in the Sol Duc's Hatchery Run, you get to see all three of the boats doing the whoop-d-do's in the waves created by the rocks that are usually a navigation hazard when negotiating these rapids at fishable flows. Shot just above the mouth of the Sol Duc River in the fall of 2002, both kings and coho salmon respond to the first rain of the fall by piling into the river. This scene played out for two days at nearly this sort of pace! Shot the same day as the video above. 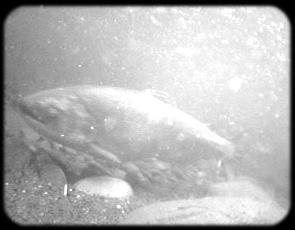 The fall rains also triggered masses of summer and some early fall coho to continue up the Sol Duc River. This was shot from Bob & Fishgal's deck. This too, lasted for several days and seemed like an endless train of fish! Two videos to choose from here, a short and long version. Shot the same days as the videos above in Fall, 2002. This video give a little different perspective of the train of fish as we placed an Atlantis underwater camera in the river below our house and watched the fish pile by. Short Version: 3.46 megs, four silvers and one king. Longer Version: 8.44 megs ten silvers and one king.